The Euclid Golf Allotment was laid out in 1913, on the front nine of the former Euclid Golf Course, land once owned by John D. Rockefeller. 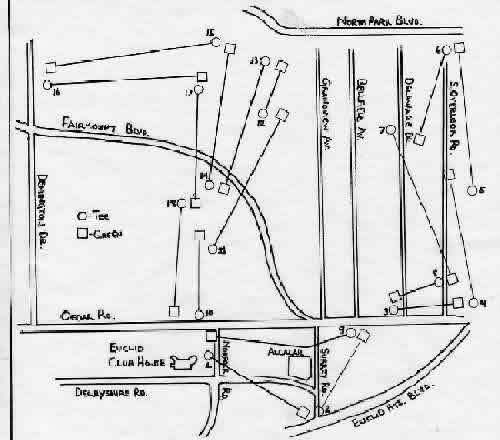 Planned by real estate developer Barton R. Deming, the Euclid Golf Allotment exemplified a new type of suburban residential development that was beginning to emerge adjacent to large industrial centers in the United States in the early twentieth century. Modeled on the Garden City Movement pioneered in England in the late 1800s, Garden City suburbs such as Euclid Golf were designed to harmonize with the natural beauty and topography of the local surroundings, in deliberate contrast to the sharp angles, tiresome predictability, and dense development that characterized most urban grid systems. Accordingly, Deming’s development called for a centrally located, yet winding, grand boulevard (Fairmount Boulevard) with curvilinear tributary streets that branched out from the main thoroughfare. eeway. This map aligns the neighborhood's current streets with the golf course tees and greens of the original club. Map developed by Hugh Fisher. IWhen construction began in the allotment in 1913, Deming sought to assure prospective homeowners that the character of the neighborhood would be preserved and their investments protected from the kinds of problems that had led to the demise of Euclid Avenue, Cleveland’s grand “Millionaire’s Row.” Thus he placed deed restrictions on the properties that prescribed setback requirements, set minimum construction costs, and prohibited most commercial enterprises. To help him implement his plan, Deming selected the architecture firm Howell & Thomas to design his model homes and oversee the design of all residences, garages, and landscaping in the development. Howell & Thomas specified high-quality designs and durable materials for use in construction, and the firm insisted that other architects match those standards. At the same time, however, residences were custom designed to suit the individual site and owner, producing much variation in the overall appearance as well as the detail of each home. Among the other architects and firms that designed Euclid Golf Allotment homes were Maxwell Norcross, Charles Schneider, Meade & Hamilton, and Walker & Weeks. Howell & Thomas designed Deming’s own residence, a four-story French Eclectic mansion that still guards the entrance to Euclid Golf from its perch on the slip of land between Cedar Road and Fairmount Boulevard. The most prevalent architectural styles in the Euclid Gold Allotment are Colonial Revival and Tudor Revival, but there are also several examples of French Renaissance, Italian Renaissance, Shingle, Prairie and Arts and Crafts. Despite such historical references, Euclid Golf homeowners enjoyed the latest conveniences and technology including chimney incinerators, heat regulators and tiled kitchens. Some even featured fireproof steel frames.